The widely scattered 6th shadow that every human being drops toward the senseless universe reflecting its lonely condition. Like grains of white sand, tightly lying on a desert land. Try to behold your existence. The masks you wear everyday. The motley-pretending way of appearing that you are so used to. You are just the shadow cast by the real one you keep trapped inside your soul. "Each shadow represents you in different ways: as the others consider you, as you consider yourself. Who are you definitely? Imagine, just for a while, that everyone conventionally casts four shadows toward the cardinal points and then two shadows, respectively toward the highest side of the sky (heaven, maybe?) and the deepest part of the earth (hell, maybe?). The first shadows represent your daily way of appearing, the last ones represent the true essence of your being. Now it’s up to you to take the final chance: Which is your sixth shadow? Is it the one that waits to soar through the sky above or the other one, the black unconscious slumbering inside of you?" This is the reading key of the My Sixth Shadow world. more electronic atmospheres and romantic piano melodies to the overall sound. 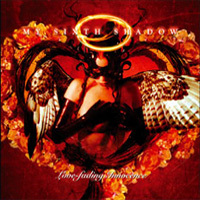 During summer 2001, after some performances around Italy and continuous style research, My Sixth Shadow started recording the 5 tracks EP “Sacrifice”. by powerful 7 strings guitars. A deep and compact work, mixing romantic emotions with aggressive guitar riffing and heavy drum patterns. Something you can call “New Wave Of Gothic Metal”. The EP was ready in early 2002, released with wonderful packaging and design made by Grace Khold (Neon Trinity Kill). Magazines started to receive the promo-packages on their desks and the feedback was totally enthusiastic. The band obtained top scoring and some features on sampler cds from the European press. Three times the featured band on mp3.com, band of the week on the Viva Text in Germany, band of the month on Psycho!, top scoring reviews on Metal Hammer, Imperiumi, Legacy and then a KKKK scoring on Kerrang UK, definitively confirmed the potential of the band. A network of fans started to grow up supporting the band in the most incredible ways. In the spring of 2002, My Sixth Shadow released a couple of preview mp3 tracks on mp3.com. “Intoxicate My Heart” and “Shadows In My Love” suddenly reached the top positions on mp3.com charts and held strong for 3 months. In November 2002, the band started to record in studio a set of 12 brand new tracks. After the recording sessions, the 6 shadows joined Darkwell as support touring in Germany and The Netherlands. Some other shows followed in Italy with Novembre, Death SS and Stormlord. In May 2003 the mix of their self-produced album was ready and the band was just going to release it independently when Voice Of Life records (Germany) contacted and signed the band for a 3 year deal with European distribution. "10 Steps 2 Your Heart" came out on 18 July 2003, featuring only 5 new tracks of the 12 track set and 5 tracks of the old EP “Sacrifice”. Released as a “preview” of the real debut album (supposed to be released during 2004), the band received again great response from the European press (Orkus, Metal Heart, Metal Observer, Metal.de, Imperiumi, and Rockhard) and performed several live shows during 2003 to promote the release. pre-master was ready in April 2004. The ultimate sound of the band was achieved: An incredible mix of deathrock/darkwave obscure sounds, mixed with modern shaped heavy metal influences, electro sounds and gothic/punk attitude. It was as though Bauhaus, Christian Death, Metallica, My Dying Bride, Paradise Lost, Depeche Mode and In Flames working together developing a new style. You can’t describe fully, with few words, such a wide mix of influences. You can just let My Sixth Shadow surround you and feel the passion behind it. and signed My Sixth Shadow for a new album in November 2004. Grace Khold, will come out in January 2005 and marketed worldwide by Masterpiece Distribution. A promotional tour is close to being arranged for spring 2005 to promote the new album release. A brand new website featuring lots of multimedia improvements and the official street team will be uploaded soon. Stay Tuned and let My Sixth Shadow surround you!